Hello Folks! 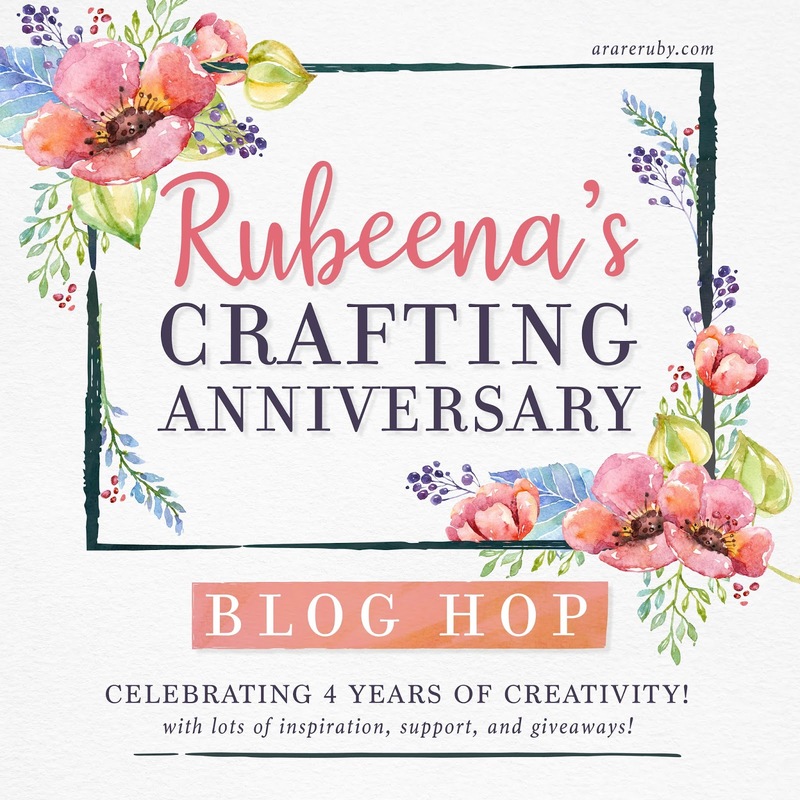 I'm thrilled to be a part of Rubeena's Crafting Anniversary bash ... a time for all of us to celebrate creating amazing things, sharing them with this beautiful community, and supporting each other in our various crafting journeys. You should have arrived here from the lovely Emily Midgett. If not, feel free to start at the beginning with Rubeena's blog. My crafting story began as a little girl learning at her grandma's feet, and has continued pretty constantly to this day. I started blogging to have an outlet for my crafting. Sometimes I was so over-the-moon excited about a project that I'd be busting at the seams to share it with someone. Usually it was my husband since he's the only one around after midnight (I'm an insane night owl), but his polite "oh, good job's" were never what I was really looking for. 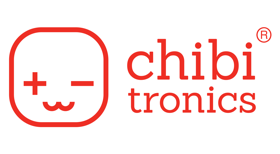 Now that I've been blogging for almost 7 years, it's hard to imagine not being a part of this community. It's gone through a lot of changes in that time, with the online idea-sharing crippling the paper crafting magazine industry (I miss walking into Barnes & Noble and showing my kids the latest Paper Crafts magazine ... they were really young and thought I was famous!) and with the move to Instagram where it's so much easier to scroll through a bunch of photos than read long blog posts. The one thing that hasn't changed, however, is all the ridiculously supportive people in our community. I've been lucky to meet many friends in person, and hope to meet some more coming up soon in January for Creativation 2019! Alrightly, on with the show! I knew immediately that I had to make something in honor of Rubeena's lovable style for this celebration. It had to be bright and colorful. It had to have lots of ink. It had to have white sentiments on black cardstock. It had to be photographed with nature elements. It had to have a great sentiment. This card continues my experimentation with Brutus Monroe's collection of Ken Oliver's Color Burst powders. Talk about fun!! If you haven't played with these before, you have to see what happens when you sprinkle the powders on watercolor paper that's been pre-moistened! Super fun to watch. You never know what you're going to end up with. Once I sprinkled the color, I misted the paper a few more times to get the water to pool on the paper. This way I could tilt the paper back and forth to create that movement in the color. I was really happy with the colorful panel, but I didn't know what kind of sentiment to put with it, until I came to Lea Lawson's blog on Rubeena's Day 1 hop. She used a sentiment from Winnie & Walter's Kindness with Evelin T set that I hadn't used before, modifying the "your" stamp to be "you." I knew this was the ABSOLUTE PERFECT sentiment for Rubeena. She really does scatter kindness wherever she goes : ) Plus, it seems to fit with the scattered nature of the card's coloring. Lea also embossed gold onto vellum, and I'm reminded at what a wonderful option this is. The semi-transparent vellum doesn't attract too much attention, and the surface of the vellum allows for the smoothest embossing ever! Just look at that gold!! More buttery gold embossing, and let's take a minute to highlight those sequins! Also from Brutus Monroe, these are bottle cap sequins with fluted edges to catch the light and sparkle. But, they're flat so are a good option when you want to keep the bulk down. Here's a closer look at the sequins, but it's also neat to look at the color a little closer. See the fun pops of green in the yellow areas? You just never know what you're going to get! In celebration of this anniversary, we have several amazing sponsors. Let’s thank them for their generosity! Winners will be randomly selected from comments left on all the blogs. The winners will be announced by Wednesday, September 5 on this page: http://www.arareruby.com/giveaways/. Winners will have up to 2 weeks to contact Rubeena at ararerubycrafts@gmail.com to claim their prize before another winner is selected. Your next stop on this hop is the amazingly talented Caly Person! What an awesome background - dramatic and beautiful! You never disappoint, my friend! I’ve never used these water colors but may have to after seeing this fantastic background. Beautifully executed! OH1 YOUR USE OF COLOR!! 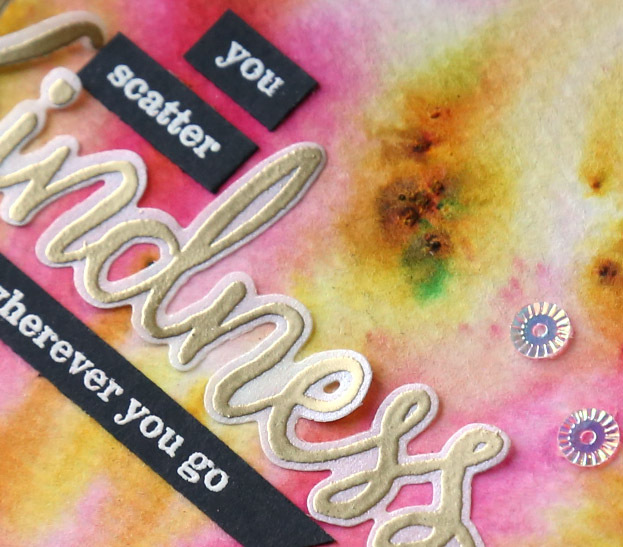 Love this awesome background....Wow card..
What an awesome background, I've experimented some with the color burst powders and they are so amazing to work with. Thank you for sharing. So colorful, looks like a tye die affect. Beautiful. Stunning card. That background absolutely takes my breath away. The background is so pretty! Love the card! Wow! This background is really stunning! And I love the card design which really highlights the gorgeous background. Love the gorgeous coloring, and the inspiring sentiments. The background is on fire. Such an awesome dreamy background!!! Gorgeous card. I love the stunning background. I have color burst powders that I seldom use, but you've inspired me to dig them out and give it another go! SO PRETTY Kelly! I def. need to get some of these powders, I STILL haven't tried them! Beautiful, bright background...pretty card! Inspires me to get out my powders again. Those Ken Oliver powders are so beautiful and I still haven't purchased any of them! You have made me move them to the top of my wish list with this gorgeous card. Love it! Such an amazing background! I love the sentiment! When I first saw your card I thought you were honoring the pink felted balls you mentioned Rubeena uses in her photography. Anyhow, stunning card and you hit the mark on the gorgeous colors, vibrancy and fantastic sentiment. Amazing card!! I've not been able to afford Color Burst or Alcohol Inks, but when I see projects where they are used, oh, they make my heart happy. Your card makes my heart happy too! Love the bright colours that look so randomly placed, yet come together so perfectly. Fabulous! Wow, love how your card turned out. I obviously need to practice a LOT more, as I never get results like that with my powders! Awesome awesome!! Thanks for sharing! So glad Ruby decided to celebrate and have this blog hop; it's so heart-warming to read so many who echo the feeling of friendship and inspiration I think we all get from reading crafty blogs! Such a happy, vibrant card!! I have the Brutus Monroe set of Color Burst, but haven't had a chance to play yet. Your video is so cool! Your card is awesome! It reminds me of a photograph of flowers that has been digitally manipulated. Very cool! Gorgeous card, love that stunning background. So colorful! I love it! Thanks for sharing! Absolutely gorgeous with that amazing background!! 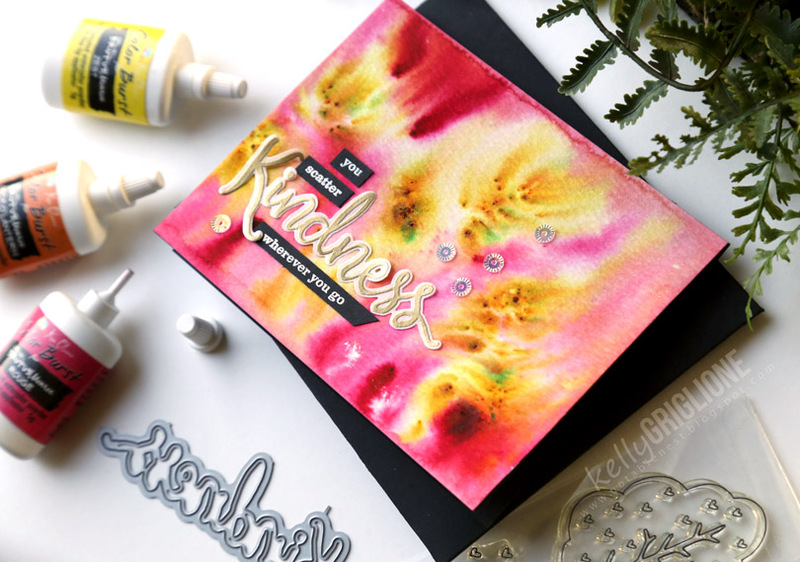 You are also using one of my very fave W&W sets...Kindness. LOVE it. What a marvelous background...must have been such fun to create! Wow !! That background is incredible ! What a fun technique !! fabulous! I just started playing with some Color Burst powders. They are so magical! What a fun background you created! I really like the gold sentiment on the vellum. Wow, what beautiful and vibrant colors on that background!!! Amazing card, LOVE those Color Bursts and your vibrant colors on your card, lovely, sweet sentiment too! 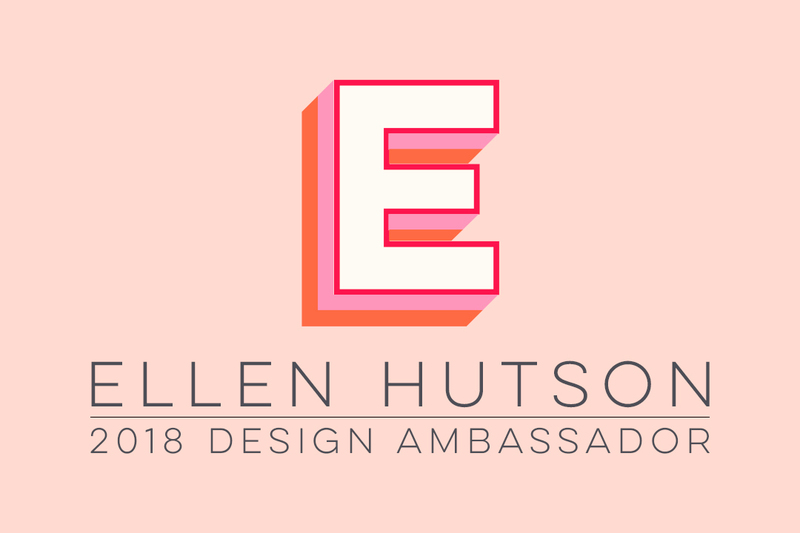 Thanks for your sponsorship and awesome blog of inspiration! WOE! That looks awesome and cool! Awesome background. The color bursts look like so much fun to play with! And I love the sweet sentiment! Awesome card! I especially love Color Burst backgronds! Congrats to Rubeena! Awesome card. I would love to try the watercolor powders. I haven't played with those color bursts before, but you've tempted me. They look great. Amazing card! Love the color burst background! Fabulous card! Love everything about it. Gorgeous card! Love the effect of the Color Bursts! Enjoying all these beautiful creations along the hop to celebrate Rubeena's crafting anniversary! Ooooo...I love that fabulous background!! Amazing background for this sweet card. So wonderful, I love how this background turned out! What a great card. Love the color burst look. Oh my!!! I'm totally in love for your stuninng card!!! Beautiful colouring!!! I have been waiting to try these but I buy so many other things!!! This is next, I promise!! Lol. Love your card!! It’s awesome!! What a creative and unique background. Great card! That's such a cool background! It's got the effect of the aurora borealis, so cool!!! What a stunning card!! 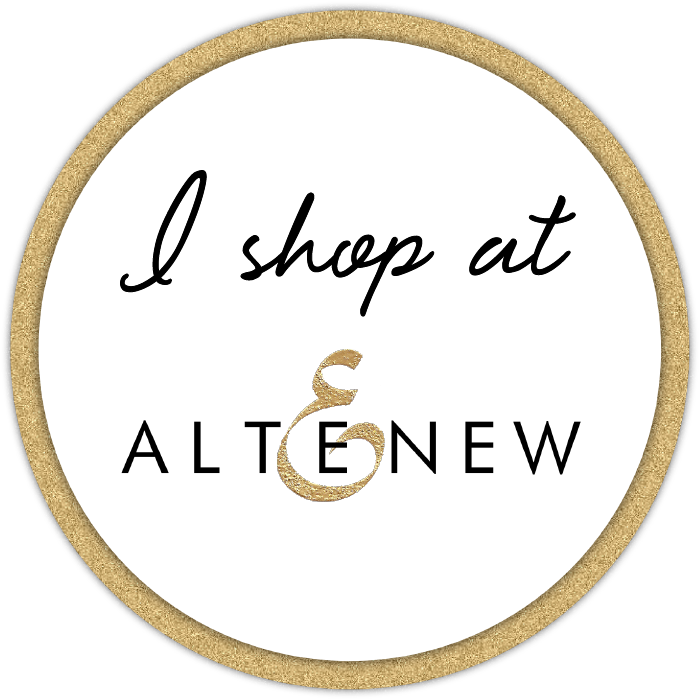 Thank you for sharing this and for being a part of this blog hop!! Wow, what a cool technique! Such bright happy colors too! Love it! 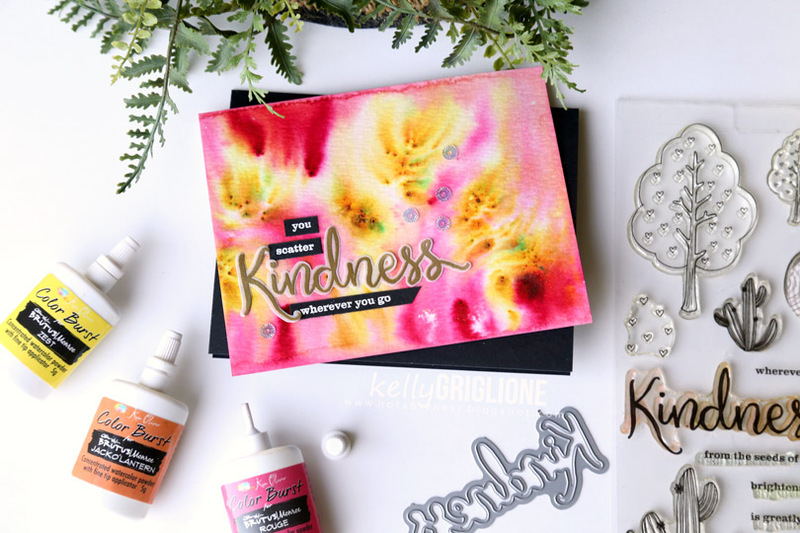 Wow, I love the bold, loose watercolor look you created for this bg, absolutely gorgeous - and using black for your sentiment strips really makes them pop! your bright colors and wonderful design and sentiment are such a fitting tribute to Ruby - fantastic card, Kelly! Kelly the colorbursts look fabulous! I have Nuance watercolour powders, and they are amazing when you do the same. LOVE this card! Gorgeous! Love the color burst effect. LOVE the unique background! Great use of those watercolors! Thank you so much for sharing! I like your "artsy" card for Rubeena. I'm sure she will like it too. Those powders are fun to use. Oh my gosh! This looks like so much fun! Gonna have to try me some Brutus Monroe coloring technique soon. What an awesome card! Love the bright colors. And perfect sentiment. Beautiful card! I love the bright colorburst background! Thanks for the inspiration! I’m with you on the husbandly response to my creations. I’ve come to the conclusion that it’s all about the process and less about the results. I’m going to play with my color burst powders now. I love the bursts of vibrant colour ! Beautiful card . Thanks for sharing your crafty story, so interesting reading about different crafters journeys into this wonderful craft . Absolutely striking! I never get mine to look so pretty. Kelly! Oh I loved reading your post. What a gorgeous project, so filled with color + life! Beautiful, Kelly, love that gorgeous background! You've inspired me to get out my few Color Burst powders & play with them. Fabulous card!! 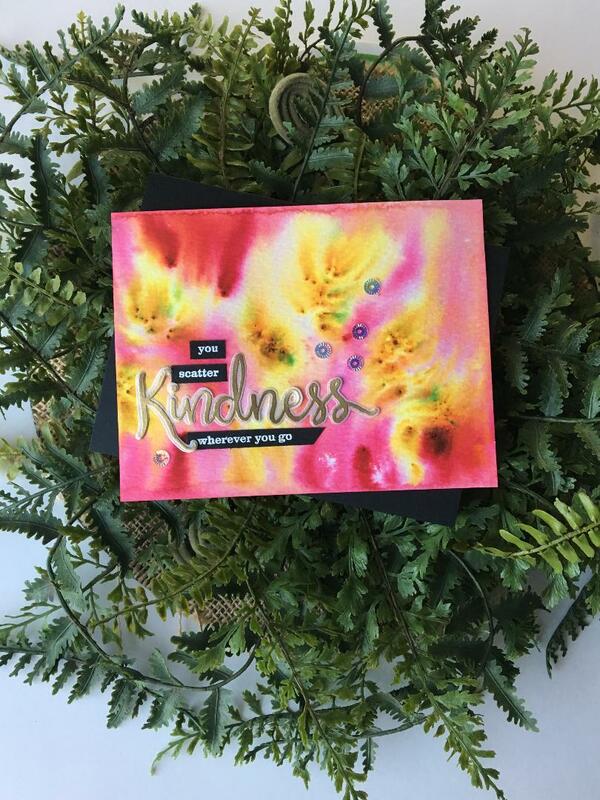 My favorite color combo is on this card, and I love how the gold shines its "Kindness" against the other colors. Really fun card!! :) Love the colors! Gorgeous! 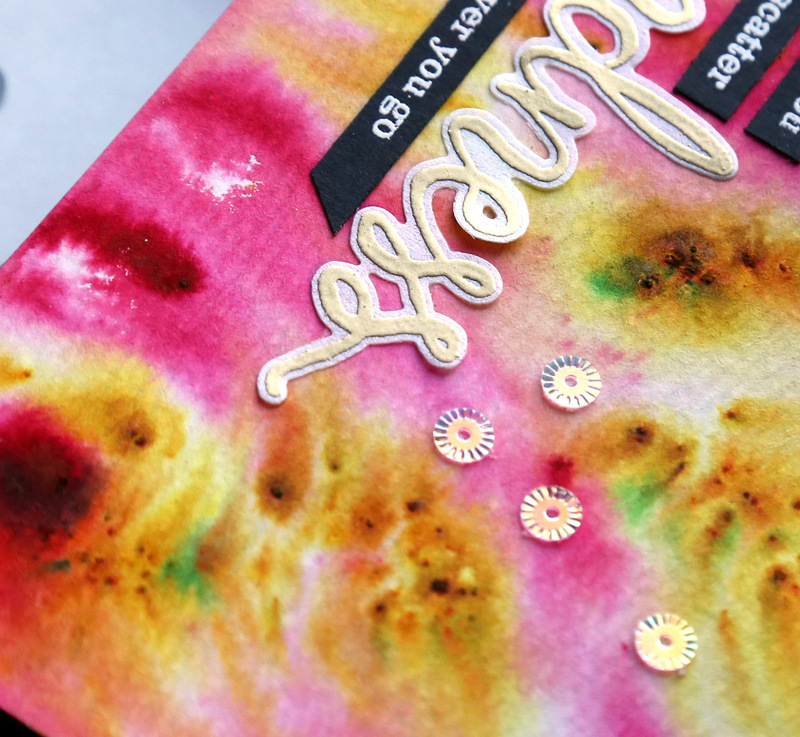 Love that colorburst background.. and the gold embossing on vellum is pretty awesome! What a fabulous background! I love the beautiful gold embossed sentiment! Amazing background Kelly, love the sequins and sentiments! Thanks for the inspiration! Gorgeous background! Love the bursts of yellow and the flecks of green. Great sentiment, too. Thanks for being a part of Rubeena's celebration hop. Oooh, wow, gorgeous background. I recently got some color bursts, love playing with them. Beautiful card! The background is gorgeous! Color Burst certainly lives up to it's name just as your beautiful card proves! Absolutely GORGEOUS, and I love the nice touch of the bottlecap sequins. TFS--have a blessed evening! Hiiii!! I'm finally hopping for day 2. OMG. you are a hoot. you totally have my sense of humor, and it makes me love you so much more!! Will you be at Creativation in January?! I'd love a proper hangout :D Thank you for being part of this celebration, for making a card that shows your joy, and for being amazing!!! That background is beautiful! I never think to emboss on vellum. I will have to give it a try. Thanks for sharing! Really gorgeous card and I love your colors! Thanks for sharing and for supporting Ruby's anniversary! Wow those powders are so amazing and vivid. Awesome background! Love the sentiment too. luv the pigment powder effect! I love your card. You are so right about Ken Oliver's color-burst whether they are his line or his partnerships with Brutus Monroe they are exciting to work with. Thank you for sharing. You nailed all your goals for this card with this card, it is fabulous! I have been looking at the Color Burst powders the last few weeks and could decide if I wanted to get some or not, well you just changed my mind on that, I can't wait to play lol and those sequins.... I've got some shopping to do! Thanks for the inspiration. What an incredible card you made !! There’s so much light and energy in it !! Thanks for sharing.